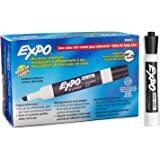 Clear barrel makes dry erase ink levels visible. 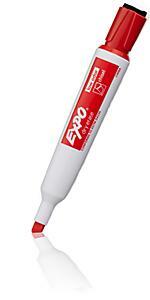 Easy-to-see ink gauge printed on the barrel. This product is manufactured in China. 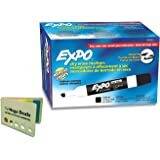 Expo is one of the leading manufacturers of whiteboard and dry erase board accessories including dry erase markers, wet erase markers, white boards, erasers and more for offices, homes and classrooms. 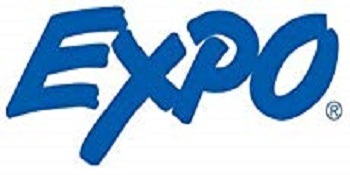 At Expo, we believe that effective communication isn't just about what you say, but how you say it. Our goal is to make products with contemporary designs, colors and features that integrate all of your important information into one flexible space. 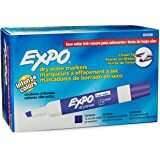 12 Expo Dry Erase Markers with Ink Indicator, Chisel Tip, Blue. This box of 12 markers are by no means cheap ($20.95 Amazon price at the time of this review), but quality dry erase markers - frankly - rarely are (so expect to pay at least $1.50 per marker). 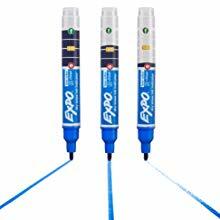 But if you are willing to pay the price these are really good markers. 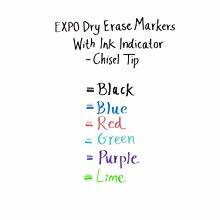 First, the "ink indicator" is invaluable. 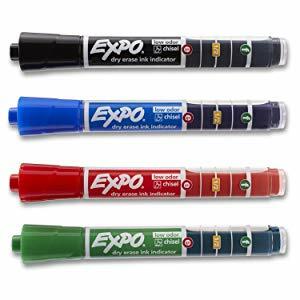 Granted, it's not a "make or break" feature unless you're in the middle of an important presentation and your marker runs dries (I bet many of you reading this has had this happen at least once). Second, the ink is quite good. 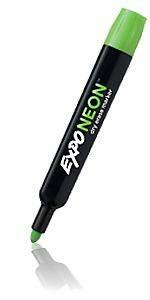 The color (green) is sharp and "deep" enough to be seen clearly from a distance. And it wipes off easily. Third, the odor. There is no odor. 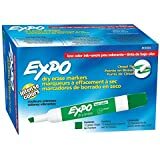 Yes, there is a slight marker smell, but not the overpowering odor we've come to expect with dry erase markers. Nice. 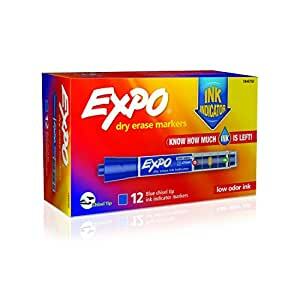 Not cheap, but you'll get excellent results. 4 stars. 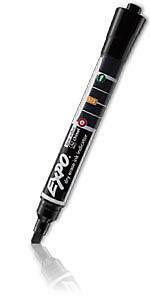 The pens work except for the black. The black ran out of ink within a four week use. 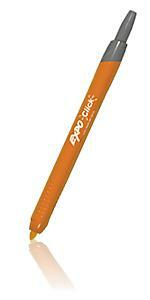 The pens we're not used every day, only twice a week for a three hour class each of the two days. Since black is my most used color I would have liked it to last longer. I'm still using the other colors, but have gone back to a " regular" black that I've had for a year. That one is still going strong!! 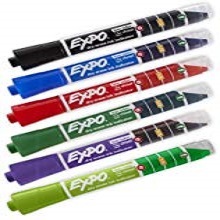 These markers are very disappointing. I manage an admissions department in a medical field. 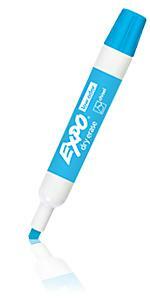 We use dry erase markers all day long to update patients status on a triage board. 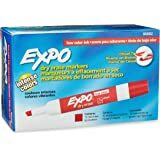 These markers are not black... they write in what can be described as a faint Gray tone. This is an issue for me because the writing cannot then be read from more than 5-10 feet away. The ink also seems to spread out slightly so the lines are not very sharp. This is also an issue for my application because space is limited so it starts to blend together. Ink indicator is cool but overall performance is not good. 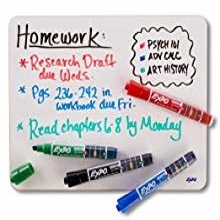 My son needed a set of Dry Erase marker for school, they do a lot of whiteboard work and each needed their own set. 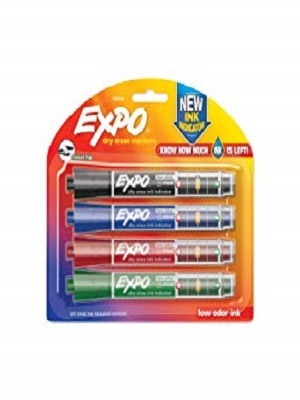 These are perfect, since I don't know the usage (how often, how much, etc) he needs them the visual of ink is great. I can easily see if they need to be replaced before he comes to me saying they aren't working. He likes them because they look a little cooler than the regular white opaque barrel. Good enough for both of us!